Mega Sale! Save 28% on the Anyoo Cotton Garden Hammock Outdoor Camping Portable 450lbs Capacity Lightweight with Carry Bag for Patio Yard Beach by Anyoo at Outlet Shopping Guru. MPN: AY-Stripe-Hammock-Red. Hurry! Limited time offer. Offer valid only while supplies last. OUTDOOR AND INDOOR USE: Perfect indoors or out. Set up this hammock in your yard and start relaxing now. 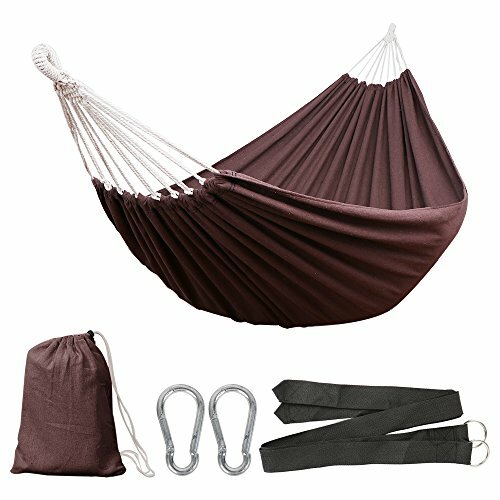 Easily adjustable hammock hooks allow you to decide how low or high you want to lay. With included carry bag, you can take it with you when out camping or hiking. PORTABLE: The display dimensions:106″ Long x 59″ Wide, Bed Size: 78″ x 59″ cm.The hammock comes with a free carry bag for easy travel. It folds into a compact size and comes with its own drawstring , so you can throw it on your back as a backpack and take it with you anywhere you want. If you have any questions about this product by Anyoo, contact us by completing and submitting the form below. If you are looking for a specif part number, please include it with your message.